A typical client of the designers of this project is a person with high demands to comfort and willingness to spend money to obtain it. That is why when it came to choosing the style of the future interior, preference was given to the contemporary one; it’s the best embodiment of luxury and comfort at the same time. One of the key elements of contemporary style is natural wood; this accounts for so much solid wood present in this project and so many finishing materials of naturalistic wood hues. 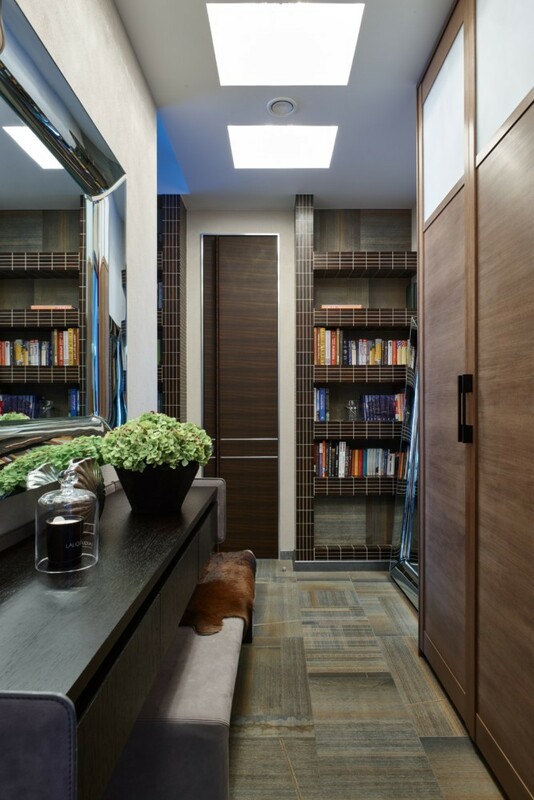 Thus, a bookcase in the hallway (the continuation of which you will see in the kitchen as well) is made from faux wenge wood tiles. To avoid a dark and dull look of this space, it was complemented with two mirrors in massive metal frames. They reflect the light and thus double its amount within such a tiny area, and also make the atmosphere of the entry more elegant. 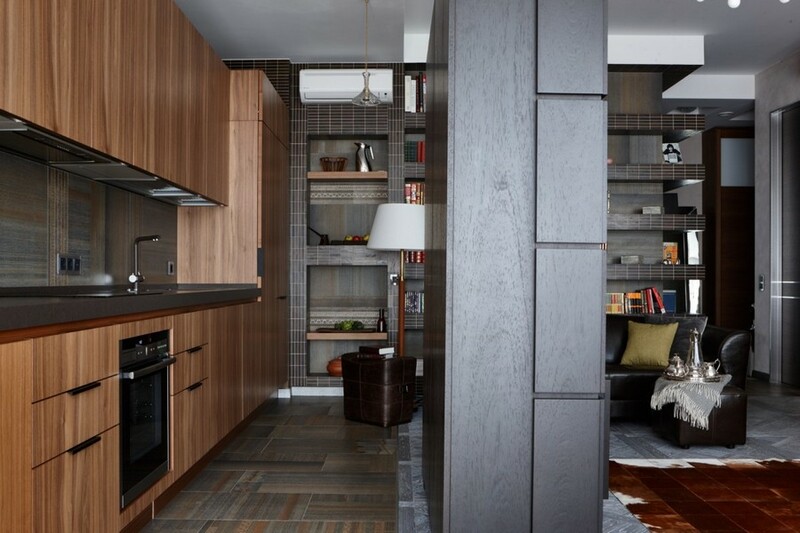 The living room and kitchen were made open-concept on the total area of 28 square meters. 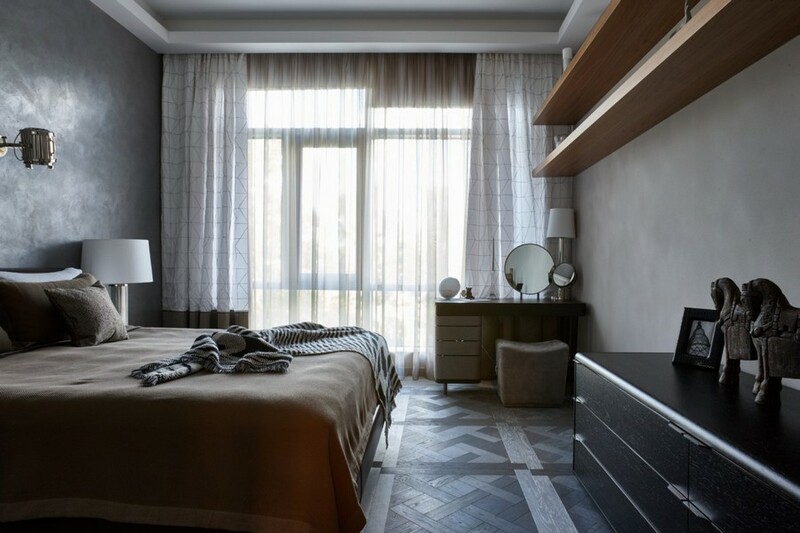 Just like in the entrance hall, the background of this zone is very light, and the floor is made from modular parquetry in versatile shades of gray. This flooring material was, by the way, used in all of the rooms with the exception of a bathroom. With reference to the bedroom design the masters had just three requirements: comfort, no superfluous details and well-thought-out lighting system. Traditionally the centerpiece of the room is a big bed. Besides it the furnishing is composed of a dressing table by the window, elegant nightstands, wall-mounted racks and a chest of drawers. So, the space is non-cluttered, pretty airy and inviting for rest. 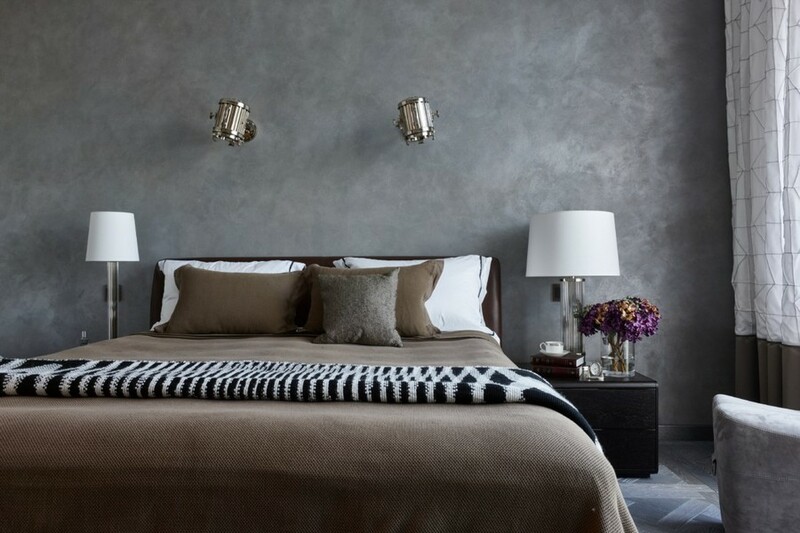 As for the lighting, it’s based on small-scale sources, such as sconces, bedside and desk lamps. But despite this fact, there is enough light for this room. 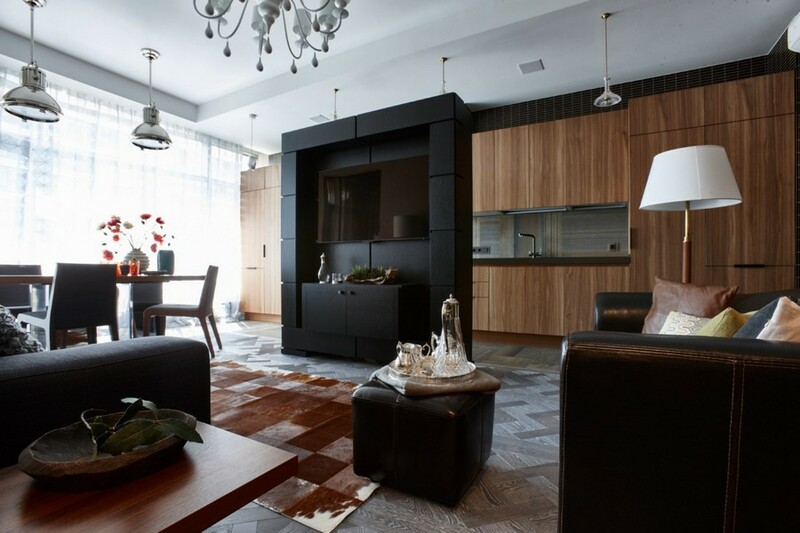 Contemporary style is the most logical choice for studies in general, and in this project the authors managed to create the atmosphere that is both homey and business-like. The most eye-catchy detail of the work room is a huge wall-to-wall bookstand of walnut color. 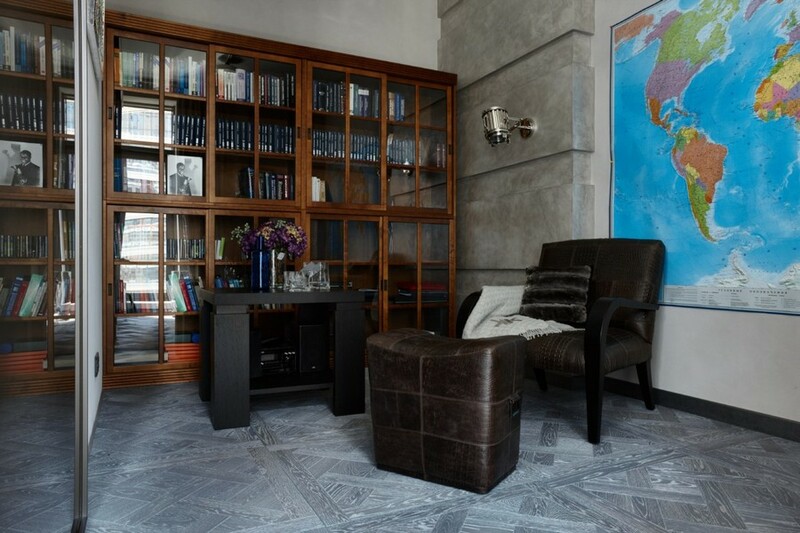 It’s complemented with a compact, yet very convenient desk, a leather chair and a big wall map. In a word, to our mind the mood of this room is very inviting for creativity. Both bathrooms are finished with large-scale grayish brown tiles. The master bathroom houses two wash basins, a shower cabin, a mirrored cabinet for cosmetics and decorative racks. The guest one features a shower cabin, a toilet, a double wash basin and a washing machine. 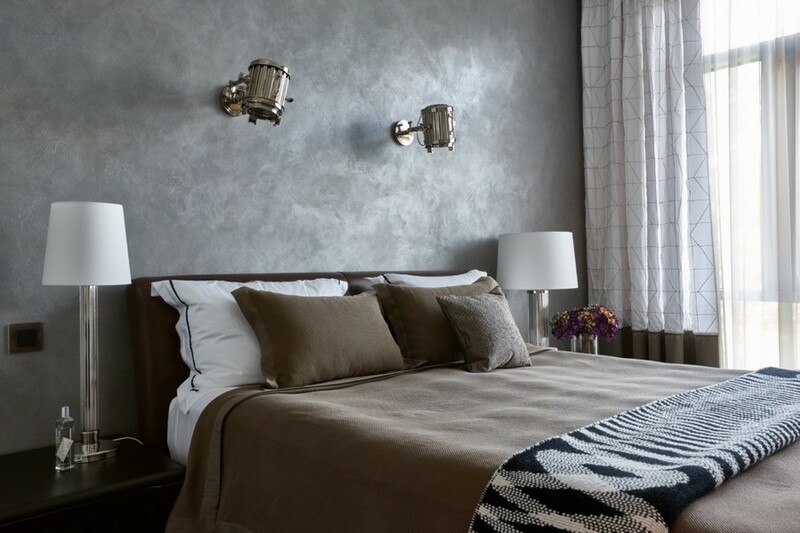 At the same time ergonomics of each of the rooms is respected to the nearest millimeter.